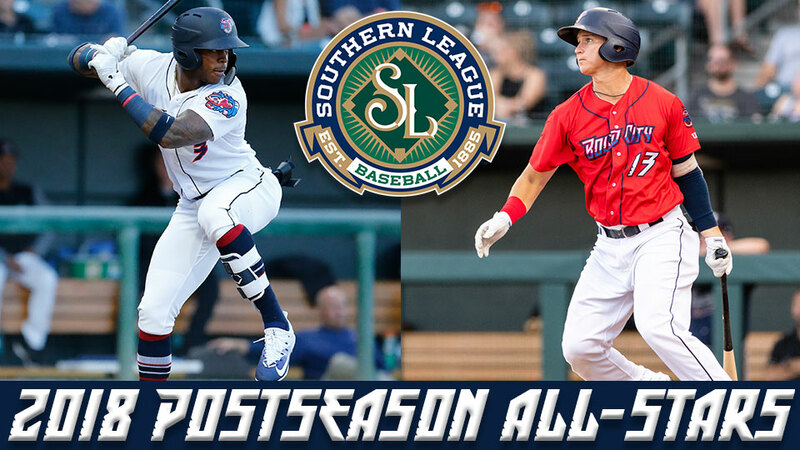 JACKSONVILLE, Fla. - Jacksonville Jumbo Shrimp outfielder Monte Harrison and third baseman Brian Schales have been named 2018 Southern league Postseason All-Stars, announced by the league office on Wednesday afternoon. Both Harrison, 23, and Schales, 22, have spent the entire season - the first for each in Double-A baseball - with Jacksonville and are league Postseason All-Stars for the first time in their careers. Jacksonville has at least one Southern League Postseason All-Star for a sixth straight season and multiple Postseason All-Stars for the first time in three years. Playing his first season in the Marlins organization, Harrison has appeared in a career-high 130 games, which is tied for the Southern League lead through Tuesday. This season he has a .243 batting average and 48 RBIs, and he is among the top four players in the Southern League in home runs (19, tied for third), hits (122, tied for the third), stolen bases (28, third), runs scored (83, tied for second), at bats (502, second) and total bases (205, fourth). Earlier this season, Harrison earned his third career Midseason All-Star honor, starting in right field for the victorious South Division in the Southern League All-Star Game in Birmingham on June 19. The selection came one year after he was the 2017 Midwest League All-Star Game Top Star and a 2017 MiLB.com Organizational All-Star for the Milwaukee Brewers. A native of Kansas City, Missouri, Harrison was acquired by the Marlins as part of a January 2018 trade with the Milwaukee Brewers in exchange for former Jacksonville outfielder Christian Yelich. Harrison was originally selected by the Brewers in the second round of the 2014 draft out of Lee's Summit West High School in Lee's Summit, Missouri. Harrison is ranked by MLB.com as the No. 1 prospect in the Marlins organization. Being named as the Southern League's top third baseman, Schales earns his first career All-Star honor. Through Tuesday, he is among the league's top 10 players with career highs in batting average (.266, ninth) and on-base percentage (.362). Schales also has career highs in home runs (10), doubles (27), RBIs (49), total bases (168), slugging percentage (.417) and on-base-plus-slugging (.779). Schales leads the league's third basemen in games (121), putouts (92) and double plays (28). Schales is a native of Huntington Beach, California, and was selected by the Marlins in the fourth round of the 2014 draft from the Edison High School. In 2016, he led High-A Florida State League second basemen in games played (109), total chances (513), putouts (185) and assists (318). In 2017, he led the league's third basemen in games played (110). UP NEXT: The Jumbo Shrimp open their season-ending series with the Mississippi Braves in a doubleheader at 5:05 p.m. on Budweiser Thirsty Thursday, when fans can purchase $1 12-oz. and $2 24-oz. beers adjacent to the Budweiser Tiki Terrace, the right-field concourse, and the Oasis concession stand behind section 115. $1 small sodas are sold at the concession stands. Gates open at 4:30 p.m. for Bud Light Football Night in Jacksonville, when fans can enter to win tickets to many different football games in the southeast. Jacksonville University Night will include alumni and students celebrating the start of another year at Jacksonville University. Fans can spin the wheel at the GATE table on the concourse to win great prizes on GATE Petroleum Night at the Ballpark The game is also presented by Cox Media.